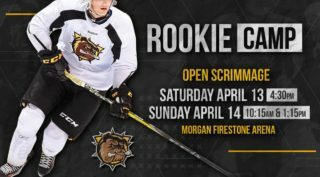 Hamilton Bulldogs first-year defenceman DJ King snapped home his first career OHL goal in Niagara on Thursday. King entered the zone late, taking a centering feed from Brandon Saigeon before beating Stephen Dhillon with 5:29 remaining in the third period of a 6-3 road loss. King, who was Hamilton’s second round pick back in 2016, scored in his 12th career contest. 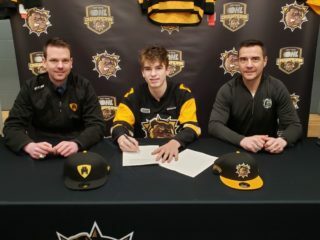 The 18-year-old from Northport, NY is a graduate of the Mississauga Rebels Minor Midget program and is the son of OHL grad and former NHL forward Derek King. Vegas Golden Knights prospect Maksim Zhukov stopped all 19 shots he faced to earn his first career OHL shutout on Thursday. The Barrie Colts defeated visiting North Bay 1-0 as Zhukov, though not heavily tested, was there when called-upon to improve to 8-5-0-0 on the campaign with a 2.83 goals-against average and .913 save percentage. 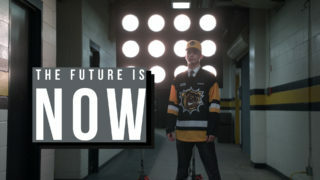 The 19-year-old from Kaliningrad, Russia was the 48th overall pick of the 2018 CHL Import Draft after spending last season in the USHL. 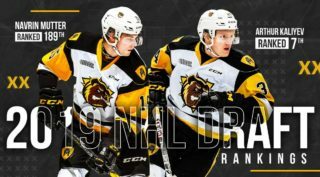 He was Vegas’ fourth round pick in the 2017 NHL Draft.